The Sun gives off a great deal of energy. As a result, ions from the upper atmosphere are pushed away from the Sun, producing what is known as the solar wind. With galaxies, a similar thing can occur. The center of many galaxies have the largest concentration of stars, and if that region is particularly active it can produce a “galactic wind” of molecules streaming away from the galactic center. This has implications for the size and activity of galaxies. If matter is streaming away from galaxies, that means there is less matter available for star production, which in turn means a smaller galaxy with fewer stars. This would particularly be true for “starburst” galaxies, where very large numbers of stars are being produced in a (cosmologically) short time. The fierce activity of a starburst galaxy produces a strong galactic wind, which would dampen the production of stars down the line. Such a mechanism would explain why there aren’t lots of huge galaxies in the universe. 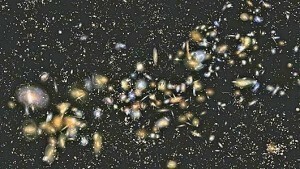 Matter in the universe is clumpy, with galaxies clustered together in groups separated by large voids. Since those clustered galaxies gravitationally attract each other, you would think that many of them would collapse into very massive galaxies. We don’t see that, however. The assumption is that as a galaxy started to get overly large, it would have lots of material to produce stars, and would enter a starburst stage. This would produce a strong galactic wind which would dampen the further growth of the galaxy. Thus there is a feedback effect that makes the formation of very large galaxies difficult. This is a reasonable model. 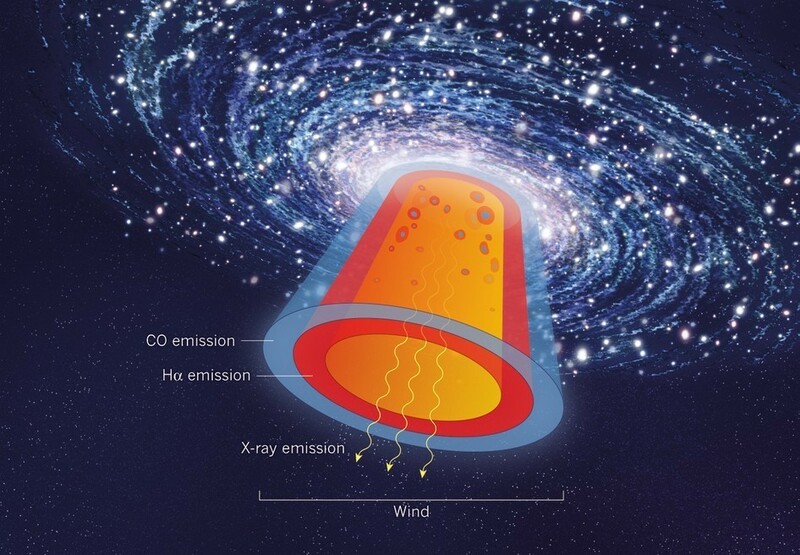 We have observed galactic winds streaming from galaxies, and more active galaxies would have stronger galactic winds. However it has been difficult to quantify just how strong a particular galactic wind is. Recently in Nature a research team has presented a solid measurement of the galactic wind of a starburst galaxy known as NGC 253. The team made observations with the Atacama Large Millimeter Array (ALMA), which is a large array of radio telescopes. With it they were able to make high resolution observations of the cold outer regions of the galactic wind. Comparing this with other observations of the warm and hot regions of the wind, seen in the image above. Since they were able to clearly observe the outer regions of the galactic wind, the team could calculate the total rate at which material was streaming from the galaxy. What they found was that the material leaving the galaxy is three times the amount of material being consumed by the production of stars in the galaxy. This means the rapid production of stars does in fact drive large amounts of material out of the galaxy. So we now have an understanding of how galactic wind can prevent galaxies from becoming too large. Paper: Alberto D. Bolatto, et al. Suppression of star formation in the galaxy NGC 253 by a starburst-driven molecular wind. Nature 499, 450–453 (2013).